^ Watkin, David (4th ed. 2005). A History of Western Architecture. Laurence King Publishing. pp. 14. ISBN 978-1856694599. http://books.google.com/books?id=39T1zElEBrQC&pg=PA14&dq=giza+pyramids+largest+structures&ei=_HVTSNTHHIP6sQPHnNm5Cw&client=firefox-a&sig=m5gbKzP5bc1gh6aiLkgFpIc_KVo. "The Great Pyramid...is still one of the largest structures ever raised by man, its plan twice the size of St. Peter's in Rome"
^ “Egypt says has found pyramid built for ancient queen”. Reuters. http://africa.reuters.com/top/news/usnJOE4AA0H1.html 2008年11月18日閲覧. 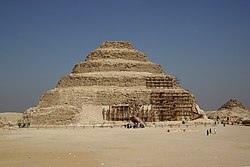 "The pyramid, which Hawass said was the 118th found in Egypt, was uncovered near the world's oldest pyramid at Saqqara, a burial ground for the rulers of ancient Egypt." ^ “In the Shadow of a Long Past, Patiently Awaiting the Future”. New York Times. (2008年11月16日). http://www.nytimes.com/2008/11/17/world/middleeast/17cairo.html 2008年11月17日閲覧. "Deep below the Egyptian desert, archaeologists have found evidence of yet another pyramid, this one constructed 4,300 years ago to store the remains of a pharaoh’s mother. 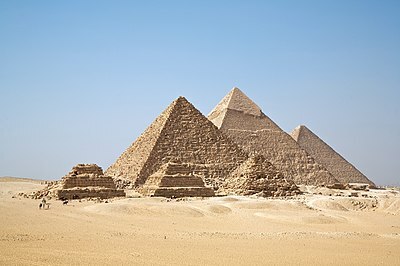 That makes 138 pyramids discovered here so far, and officials say they expect to find more." Ancient Authors – A site that quotes descriptions of the "Labyrinth" of Amenemhet III's pyramid at el-Lahun by various ancient authors. ANCIENT EGYPT - History & Chronology – A site detailing the major pyramid sites of ancient Egypt and Nubia (Sudan). The Pyramids of Egypt - The meaning and construction of the Egyptian pyramids by Egyptologist Professor Nabil Swelim.